A voluntary recall is being conducting on Kroger Value Semi Sweet Chocolate Chips because the product may contain undeclared milk protein. 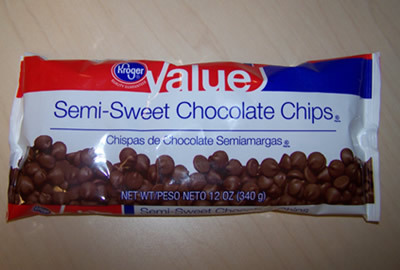 Packages of the affected semi sweet chocolate chips have a UPC Code of 11110-86603. For a complete list of the affected “Best By” dates, go here. Consumers who have purchased the recalled semi sweet chocolate chips can return the product to the place of purchase for a full refund. Consumers with any questions may contact Barry Callebaut USA LLC at 1-866-678-5231 between 9 a.m. and 7 p.m. ET. Seriosly folks…”Toxic Waste Brand Nuclear Sludge”???? Who would eat this stuff?? Our own FDA standards sometimes fail us, but would you eat something from Pakistan??? Is it just me or have you seen just a glut of imported foodstuff lately, especially from dollar-type stores? Buyer Beware!! I used these chips in some vegan chocolate chip cookies for a relative. If she had a serious milk allergy it could have been bad, but instead it was merely funny. I won’t tell her. Thanks, Tara, for posting this. I had a couple of bags of these chips in my pantry (one that had already been partly used), but they weren’t part of the recall. I am very thankful for this because my daughter has a severe milk allergy, and consuming the chips could have caused an anaphylaxis reaction. I’m not sure what the other readers who made comments found so funny about this. Thanks for all you do to help others. Kathy, I agree. Not funny at all!! !